Where’s the mystery in Thanksgiving? That’s an easy one. It’s the gravy. HANK PHILLIPPI RYAN: Why is it after so many years of making Thanksgiving dinner for various numbers of family and friends, every year on Thanksgiving morning I wake up with the burning (ouch) question: How do you make gravy? Is it easy for you? I’ve been a TV reporter for the past 40 years. I’ve wired myself with hidden cameras, gone undercover into tricky situations, confronted corrupt politicians and chased down criminals. But the gravy thing? No can do. First you have to wait til the turkey’s done, right? Then somehow, lift the huge and hot turkey out of the roasting pan without ruining the perfectly brown (if you’re lucky and careful) skin and transfer it to a platter. They never tell you exactly how to do that. The turkey is, once again, safely placed on the platter. The fragrance is tantalizing, amazing, irresistible, and people are ready to eat. Happily, there’s the “the turkey has to rest” rule, or else the gravy would never get made. Into the oven goes the other container of stuffing, the sweet potato casserole, and the experimental dish I make every year that no one eats. Hoping that because there are three things in the oven trying to cook at 350 degrees at one time doesn’t throw off the temperature somehow. My sister, a real chef, says real chefs just turn the oven to the highest possible temp and cook the food til it’s done. Thanks, Nancy. YOU come over and do this. Anyway, praying for side dishes, you can no longer ignore the gravy. Balanced on two burners on the stove , that roasting pan sits, taunting. One recipe says “Skim off the fat.” You know how long that takes? And how difficult that is? I’ve purchased ever fat-skimming implement known to Sur La Table and I’m here to tell you, for me, they don’t work. So, for a couple of minutes, I pretend to skim off the fat. The turkey juices are beginning to bubble. I must make the oh-so-critical next decisions. Thickener. Flour? Cornstarch? Whatever arrowroot is? Maybe no thickener? Just clear gravy? Back in the recesses of the left-hand cabinet, I find can of chicken broth. Does a little rust around the edges of the can make any difference? Should I have saved the giblets? And what are those, anyway? But too late now. The turkey juices are bubbling. I whisk the brown stuff (what is that anyway? Do we want to know?) off the sides and bottom of the pan and into the mix. Someone asks if there are appetizers, and if so, when we’re having them. Someone is about to get clobbered with a wooden spoon. Cornstarch it is. I dump cornstarch into a Pyrex cup of water—would it be better to put the water into the cornstarch? And make a little paste. I stir it into the pan juices. I think this is right. Whatever. No going back now. Someone offers me champagne. Apparently, in the other room, the party is starting. I take a sip of the champagne—and dump the rest into the gravy. Stir stir stir. Add the chicken soup and a can of water. I’ve crossed the gravy Rubicon now. Wishing for more champagne. Stir stir stir. I hope I remember this for next year. Time-saving hint coming up! Fresh from the pages of a well-known women's magazine!! Purchase turkey PARTS and make the gravy the day before!!! Yay!! Start the stress a day early!!! Happy Thanksgiving to all! While the turkey is roasting, I cook the neck and the giblets, covered in water and about a quarter cup of wine, in a saucepan. This will be the liquid I use to make the gravy once the turkey is out of the pan. I have a little mop-like thing that is the best fat-skimmer I've found. It gets a workout while the turkey rests on the platter. Cornstarch in water for thickening. Stir with my I've-had-it-as-long-as-we've-been-married slotted spoon that is really all slots and not much spoon and always makes my sauces and gravies lump-free. Giblets cut up and dropped in. Cook until thickened; correct the seasoning. Pour into the gravy boat and everyone else pours it over their potatoes and turkey . . . .
That is a fabulous narrative, Hank, and I'm betting I'm the first commenter because everyone else is speechless with self-recognition. I know the fear of which you speak. That the gravy will be lumpy, or tasteless, or greasy. I also know the heady sense of triumph when it magically turns into gravy. Well done, both making the gravy and describing making the gravy, and Happy Thanksgiving! I'm really not sure how I do it. I roast the neck with the turkey. Somehow juices end up in the bottom of the pan, which get combined with a little chicken or turkey broth. Heat and dump in flour by the tablespoon, stirring constantly until - gravy. It gets consumed every year, so I must do something right. Agreeing with everyone: there's no trick. Flour. Cornstarch. Giblets. As long as it's not out of a can. The hard part for me is that you can't start gravy until the turkey's done. Those drippings are what make it work. And by then I've had a glass or two of wine and, well, you know. Joan: My spoon like that finally died. Got myself a whisk! Joan, may I borrow that spoon? Off to the office..more to come! Exactly, Hallie! There's no way to prepare. And yeah, by that time, everything is chaos and it seems like it's taking a long time. But everyone clamors for gravy! Whenever we have chicken I make stock from the bones and freeze it in small bags. That way I always have the base for good soups or gravies. I wouldn't use much of the stuff that the turkey ran because it's always so fatty as you say. I melt butter, thicken with a little cornstarch then stir in liquid. But Hank, I never buy a 25 pound turkey. The meat is too tough. I buy 2 12 or 13 pounders and cook side by side. Also makes 4 drumsticks that the kids like. Brilliant, Rhys! And thickening the butter with cornstarch..hmm. I like it. How does the cooking time change with two turkeys? Wonderful description! I cheat and make the gravy on Thanksgiving day with a canned broth base and add a small amount of turkey drippings for flavor, not worrying about the fat. But then I don't make mashed potatoes, either - butternut squash instead. The day after Thanksgiving I make real turkey gravy and mashed potatoes to go with the leftover turkey. And I always make enough green been casserole so there's plenty left for Friday! Hope you're talking about cranberry sauce tomorrow! I hate gravy. I never use it to ruin my potatoes. So don't worry about it on my account. Hated gravy. Makes a good epitaph! 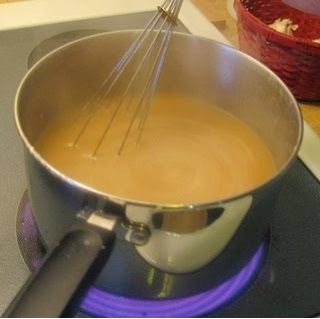 I adore my whisk and would not make gravy without it. You're so funny Hank, the champagne in the gravy was brilliant! Next time have them bring two glasses:). FChurch and Lucy/Roberta have it! Do the basics the day before (or, I suppose, 2 days before so Hank can catch her breath) and add drippings at the last minute. I remember my parents putting the roasting pan outside in a snow bank to help congeal the grease. Hey, if Mother Nature gives you a snow storm, use it! I am so glad to know I'm not the only one who finds those Currier & Ives holiday pictures intimidating. Happy Thanksgiving to all Reddians everywhere. Hank, I have a mental block a mile high against making gravy. I've convinced myself that I can't do it, which is odd because I normally will try most dishes. My mother made wonderful gravy, as does my mother-in-law, so there's never been a born-of-necessity reason for me to make it for the holidays. However, I do need some for when we are eating at home after the big meal. For the past several years, I have turned to Sam's and bought tubs of their gravy, which is very good. Oh, and Hank, too funny about the champagne in the gravy. And, Hallie and Mark, I love the "Hated Gravy" epitaph. One of the reasons I don't make gravy, too, is that I have the turkeys cooked elsewhere. When I started doing that it relieved a lot of the stress of making a holiday dinner. Now, though, FChurch has given me a wonderful, stress-free way to tackle making gravy by doing it the day before using turkey parts. I could have back-up Sam's gravy if my day-before one fails. Thanks, FChurch! My family has always done just clear au jus instead of gravy. I think of gravy as cafeteria food because that is where I've eaten thickened gravy-- school cafeterias. I don't think we were in any way health nuts, but our Thanksgiving menu was always plain (but delicious) roasted turkey, plain mashed potatoes, cut up yams or sweet potatoes without anything on them because the sweet ones are sweet enough, plain boiled green beans or brussels sprouts or broccoli (or all three), a relish tray, the famous Jello mold, and plain canned cranberry sauce. And dressing (cooked outside the bird). And pies of all kinds. In later years, we went to fancier cranberry relish or chutney rather than canned cranberry sauce. But just pan juices-- defatted-- for the bird. And that's what I come down to when I make it. Except when I make chestnut puree.... but that's a whole separate story. 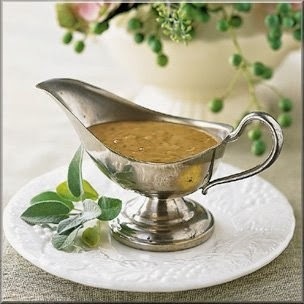 Yup, champagne gravy, must do! I'll try it this year too, what can it hurt? LOVE the snow bank idea! That's so...sweet. I have exactly the same reaction every year, Hank. "Yikes - how do I do this again? What are the proportions? Hand me the wine!" I like the idea of throwing some champagne into it (which we might, in fact, be imbibing, because I have some good news I can't share yet, except with family...). Happy day to be thankful to the whole Jungle Reds community! Funny thing about gravy...though I am not a big fan of gravy, I do eat turkey with gravy ONCE a year at Thanksgiving dinner because my cousin is the best at making gravy. I think she used drippings from the turkey and mixed it with some flour to thicken the gravy. And yes, it has butter too. Thanks again for a great post as usual. Yeah, anonymous--when it's good, it's really good. DebRo--can Steve come to our house?? Hank! Why didn't I read this yesterday? I would have bought champagne. Do you think Grey Goose would work? Roux. Make a roux. Foolproof. Unless you screw it up of course.